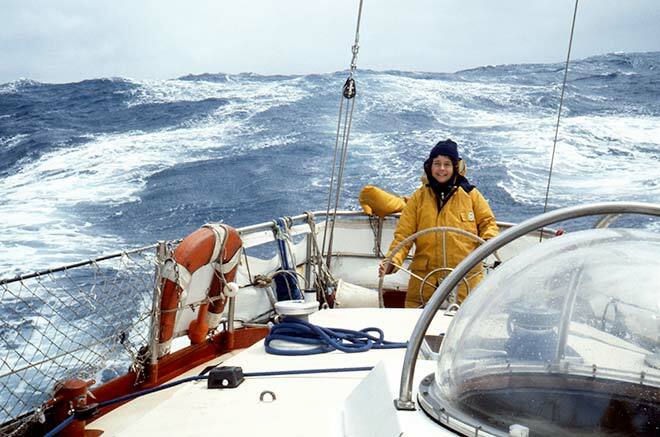 Christina Troup is shown on board Damien II, en route from Lyttelton to the Antarctic Peninsula to take part in penguin survey work during the summer of 1982–83. Troup later joined Te Ara as a writer with a particular focus on entries about birds. I was delighted to join the Te Ara team in 2004 as a science writer for the Earth, Sea and Sky and The Bush themes. Te Ara has become the backbone of New Zealand’s presence on the world wide web, providing an authoritative, accessible source for information on a wide range of topics. Having hitherto worked in remote locations for long periods, it was a novelty to live in Wellington and join long lines of earnest foot-commuters in the daily stampede along Lambton Quay. At that stage Te Ara was headquartered in Radio New Zealand House, which to me (as an avid listener) seemed like the centre of everything. This location proved to be a great place to conduct secondary research. Wellington is a wonderfully information-rich city, with the opportunity to source material from the National Library, Archives New Zealand, Wellington City Libraries and Victoria University, all within easy walking distance. We also had ready access to government departments and ministries relevant to those themes, including the Department of Conservation and those responsible for fisheries, agriculture and bioprotection, and research centres such as NIWA (National Institute for Water and Atmospheric Research). I loved the variety – a day could involve working on bird migration one minute and deep-sea creatures the next, or albatrosses then ants. At neighbouring desks colleagues might be working on stories about the Polynesian settlement of New Zealand, or about state housing, international economic relations or hot-air ballooning, continental drift or canoe navigation. Imagine the morning-tea conversations! What a great group of interesting people – not just the writers, of course, but the teams locating photographs and illustrations, creating graphics, editing text, managing production deadlines, dealing with copyright issues and generally keeping things flowing and maintaining quality standards. I love the result, and look forward to the day I can declare that I’ve read and digested every story!